Just when the Carrot Museum thinks it has seen everything another fantastic find comes along. 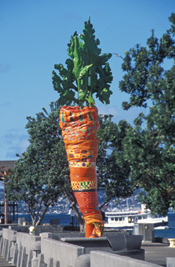 Down in San Diego Artist, Lauren Jackson, created 17 foot outdoor sculpture called "Soft Sculpture Carrot", using the Carrot Museum for research and inspiration. 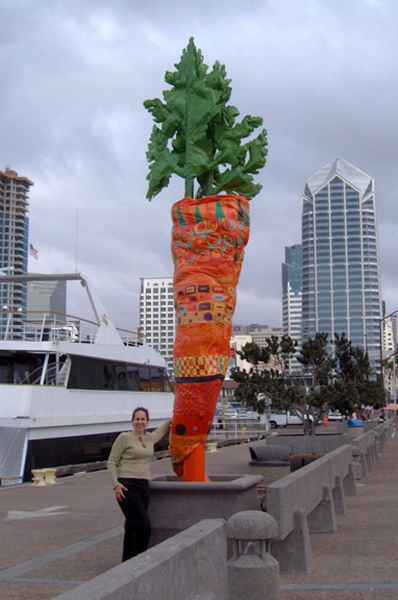 Soft Sculpture Carrot is an original, one-of-a-kind sculpture designed by artist Lauren Jackson and originally displayed in San Diego for the Port of San Diego's Urban Trees Outdoor Sculpture Exposition. Blending the elements of soft, natural and organic, with the massive steel and concrete found in cities was the challenge facing Lauren Jackson when creating her carrot. "I considered the size, shape and location of the Urban Tree and felt a larger than life orange carrot would look spectacular against the colors of San Diego Bay." Soft Sculpture Carrot has been seen by thousands of visitors to San Diego's Embarcadero and Harbor Areas and has been featured in American Style Magazine (August 2004), San Diego Art + Sol Magazine (September 2003), The San Diego Union Tribune (November 2003), and other numerous web sites and publications. The sculpture was located in the harbor area frequented by many cruise ship passengers from around the world, as well as San Diegans, Mexicans, and other tourists to the area. She had to work closely with the Port of San Diego engineers who performed a wind analysis to ensure it would stand up to the outdoor conditions. She wanted something that would be universally recognizable to people of many cultures, and, in the same vein, something that would cross social and economic boundaries - i.e. the idea that carrots are cheap, easily accessible, enjoyed and often eaten by everyone. Through the Carrot Museum she learned all this was true of carrots. Lauren, originally from Brooklyn and now lives in San Diego says " Additionally, for the sake of children, an audience I also strongly considered, carrots are of course associated with being good for you, or just being good, so this was appealing -- I didn't want to do some "moralizing" vegetable that one is supposed to eat." Of course, the Urban Trees public art project is about trees, not vegetables per se, so doing a carrot was somewhat of a play on the theme of the event, both on the question of what is a tree and what is an urban tree. The body and leaves of the carrot are constructed like a quilt, using an industrial fabric called "Tyvek" and hand painted by the artist with oil-based enamel paints. The carrot and leaves are filled with self-hardening polyurethane foam. The carrot is built around a 10 foot pvc pipe 8" in diameter and the leaves are attached to this pipe using 1 1/2" and 2" pvc pipes. All materials are designed for outdoors and are waterproof, wind, sun and salt resistant. The sculpture is signed and dated by the artist and is in excellent condition. Lauren's comment on its construction " Making the carrot out of fabric which is painted and sewn like a quilt, was done largely out of technical necessity, since I don't really work in traditional outdoor sculpture materials, but, the materials and approach, along with the ringed pattern that forms around the carrot, felt like a metaphor for cities built upon cities, each with a new generation of vibrant people and ideas which in turn creates the place they come from. And finally, something about carrots seemed to reflect San Diegans who are generally sunny, warm, brightly spirited and down to earth. Manoeuvring a 6 foot carrot leaf around me and the sewing machine proved to be a test of patience and machine sewing skill". The carrot was on display since November 2003. In November 2004 it was be up for sale for an asking price of $7,500.00. The base was not included in the sale and would need to be provided by the buyer. Soft Sculpture Carrot weighs approx. 200-250 lbs. and stands 17 feet tall without the base. So if anyone has the space and the money, go and talk to Lauren. Soft Sculpture Carrot now has a new home. It’s been repainted and installed in Lauren's front yard. An extra special thanks goes to Mark Larson and Michael for their engineering know-how, and the sheer brawn required to lift the carrot onto its new base. Once again the carrot has another new home in the City of Carlsbad CA Sculpture Garden for one year, 9/06-9/07. The show called, "Suburban Trees", features 7 local sculptors. Long may it please those who gaze at its beauty.